After hearing a lot about Montgrony the last year or so we finally made a visit to this legendary climbing area earlier this week. We where blown away. It’s not big, about 300 routes in total, but the quality of the climbing is just fantastic. To fully enjoy the venue I would say it’s good to be comfortable on the steep stuff and being able to on-sight 7a or so. For my climbing partner and me, just breaking into the 7th grade, it was quite the experience but we where clearly limited in our selection of routes on the main wall. On the upper wall and the surrounding areas (there are hundred of more routes on the nearby walls), we have enough climbing for many, many visits. The area is only about 1 hour from Girona, the city where the RyanAir flights to Barcelona lands. A cheap flight from anywhere in Europe, a rental car and you’re ready to climb! Oh, yes, you need a guidebook. For that I highly recommend the new Ripollés guidebook, buy the guide and you help giving back to the local climbing community. The guidebook is by all accounts superior to the Rockfax or the other guides I’ve seen from the area. (The guidebook will of course be available from us as soon as we have negotiated the final details with the big bookstore that will handle our shop.). Best time of year to climb is from October to April. After that you’re limited to climbing early in the morning or late at night, the walls are 80% south facing. We climbed there now in end of December and started the morning with down jackets and where able to climb in t-shirt just a couple of hours later. Montgrony is at high altitude, 1400 meters, so it gets cold at night and you might just get snowed on. And then, finally, where to stay? I was so taken by the climbing and the area that I went straight in and talked to the owner of the hotel laying, well, among the cliffs. We are therefor happy to present possibly one of the best situated lodging offerings for anywhere in Spain. You can reach out of the hotel and touch the rock. Here is a longer presentation of Hotel Montgrony and the offer we made for you. Any questions or thoughts? Just post a comment and we’ll try to answer! 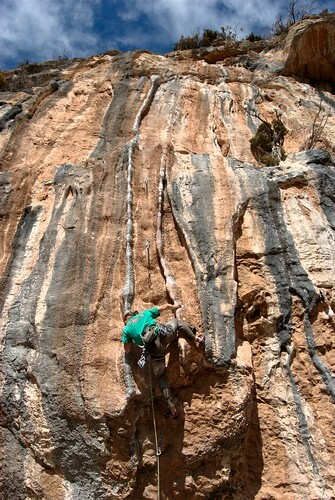 Tagged with limestone, sport climbing, tufas. Thank you for excellent beta. Where can we buy the gudebook you mention?